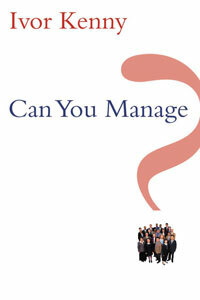 CAN YOU MANAGE? asks a critical question for all who hold or aspire to a management role. Ivor Kenny’s pithy observations are based on a lifetime of observing managers and leaders at work – as a board member, a consultant and as an academic - helping them to develop strategy and to implement it in the marketplace. This key text should have a place in every manager’s heart – and on their bookshelf. He has tried to distil into a slim volume lessons learned working with managers for 40 years – 20 in the Irish Management Institute, where he became familiar with theory, and 20 in UCD where he worked with managers in international companies. He has plundered earlier books and added new material, about half-and-half. The point of the book is that, since few things are black and white, clear-cut, either/or, we have to manage in a way that accepts the existence of contradictory phenomena without trying to resolve them. His hope is that it can be a reminder, timely or otherwise, that brings to the surface thoughts buried under the press of events. Why do some businesses give the impression that they hate the customer? Is it because people are in the wrong jobs? The secret of efficiency is enthusiasm. Compulsion doesn’t work. A macho manager goes like a bull at a gate. Avoid using a sledgehammer when a feather will do, but keep the hammer handy. Management by slogan is good only for pub-talk. True humility is knowing yourself and the effect of your actions on others. Leadership is a combination of character (who you are) and Competence (what you can do). A good boss is tough but fair. A leader who has sorted out his inner conflicts will convey a sense of optimism and hope. Cheer up. Strategy is the step by step removal of removable constraints. Does our lack of enthusiasm for strategy come from the fact that the future is unpredictable or that we are simply going about strategy the wrong way? The essence of strategy is to build an arsenal of capabilities to meet whatever the future throws at us. One of the greatest barriers to change is lack of cohesion in the top team. People do not resist change. They resist loss. It’s not what’s ahead – today is the golden time. 1. Are You Being Served? 19. How Do Managers Learn? Ivor Kenny is something of an elder statesman in the world of Irish business and has a well-deserved reputation as a sharp observer of management, his thoughts mined through a combination of academic study and field work with leading organisations and CEOs, he has also served on the boards of leading companies such as Smurfit Paribas Bank where he was Chairman for a number of years, was also a long-standing member of the board of Independent News & Media and was Director General of the Irish Management Institute from the early 1960s to the early 1980s. His ideas are distilled here in a revised version of an earlier work, itself pulling together some of his key observations about organisational practice. It’s a book that transcends business and is a much about human nature as it is about corporate life. Poets and philosophers are quoted liberally here, alongside CEOs and business school academics. Kenny has a confident and assured style and knows the value of story-telling to get his points across. We are never too far from an anecdote here. He also meets his stated aim of achieving a balance between brevity and reduction ad absurdum. One of the key messages in the book is that management involved achieving balance between strength and resolve and humility and flexibility. The capacity to comprehend and live with ambiguity is important, he notes. Ego can be toxic and macho management doesn’t work in the longer run. As he observes: Shoot outs work best when the other guy dies. When you have to continue to work with him, such macho confrontations complicate life – inevitably he will be waiting for you in the long grass. Among other observations here are, the secret of efficiency is enthusiasm, compulsion doesn’t work; people do not resist change, they resist loss and one of the greatest barriers to change is lack of cohesion in the top team. There’s a lot of sound lessons here in a mere 83 pages. Ivor Kenny has a well-deserved reputation as a sharp observer of management, thanks to his combination of academic study and field work with leading organisations. His ideas are distilled here in a revised version of an earlier work, pulling together some of his key observations about organisational practice. The book transcends business and is as much about human nature as it is about corporate life. Poets and philosophers are quoted liberally, alongside chief executives and academics.